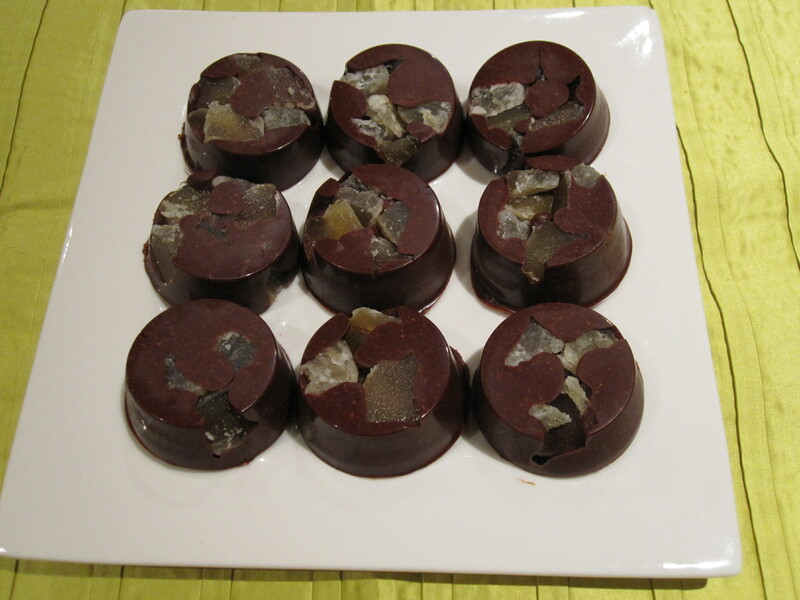 In into the bottom of a silicon chocolate mold place the crystallised ginger pieces. The chocolate will be poured over the top of these. To make the chocolate, combine in a bowl the butter, cacao powder and salt. Add in the cashew flour and sweetener 1/4 at a time and stir. Make sure you taste test and note the consistency as you mix the chocolate together. You want the chocolate to by runny and smooth. If you need to you can mix together in a bowl over hot water to keep the chocolate melted while making. When you are happy with the consistency and taste, pour into the chocolate molds and place in the freezer to set for 10 minutes. Note: To melt the cacao quickly, either chop or grate into small pieces. I used coconut sugar in this recipe and it tastes really nice but as it doesn’t melt you do get a grainy texture to the chocolate rather than a silky smooth finish.